Belarusian analysts discuss recent foreign policy developments, the failure of the government to attract investors and two realities created by the state and independent media in Belarus among other issues. 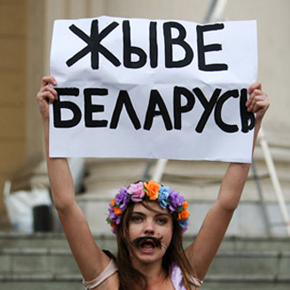 In Belarus neither women nor men want feminism. A sociological survey of people’s attitudes towards feminism, undertaken in early August, shows that Belarus has the lowest level of tolerance towards this movement among the CIS countries. Head of the international Association on Gender Perspectives Alyona Alkhovka says that such attitudes of Belarusians towards feminism are caused by the distorted understanding of its core idea, which is differentiation between the biological and the social roles of genders. Psychologist Vladlen Pisarev, on the other hand, explains the lack of sympathy towards feminists by their apparent harshness and aggression, as well as by the fact that a strong tie between the woman’s biological and social role is the natural order of things. ​Diplomatic War Would Erupt Even Without the Teddy Bears. Aleksandr Klaskovsky discusses different sides of the teddy-bear scandal, its background and consequences.The journalist dismisses the version that the incident was planned by the European authorities, suggests that firing the two military generals was in Lukashenka’s plans anyway, and reaches the conclusion that the diplomatic war would have happened even without the teddy-bear scandal. Lukashenka plays the Makey card. President Lukashenka has appointed the former head of Presidential administration Vladimir Makey as the new head of the Ministry of Foreign Affairs. Despite the fact that Makey is on the EU’s black list, experts see this step as an attempt to restart relations with Europe with a new person at the head of the diplomatic corps, and also release the pressure of strengthening geopolitical ties with Russia. But do relations between Belarus and Europe really depend on the figure of the Minister of Foreign Affairs? Meanwhile, the EU is going to work with Makey in the same way as it worked with Sergei Martynov, says the EU diplomacy head’s press-office representative Sebastien Braban. The teddy bears turned out to be geopolitical bombs – Artyom Shraibman, an author from naviny.by, is analyzing how the teddy bear incident has triggered a serious geopolitical game between Russia and Belarus. The reporter implies that Russia will not hesitate to benefit from the upset of relations between Belarus and Europe, using it to deepen Belarus’ dependence on Russia as its only geopolitical partner left in the international arena. BISS Trends for January-June 2012 are released. The report covers the following areas: political democratisation and liberalization; economic liberalisation; good governance and the rule of law; geopolitical orientation and cultural policy. While the first three remain mostly stagnant with few changes (e.g. few, though reversible, liberating measures implemented in the fiscal policy, while the old opaque privatisation schemes returned), in the geopolitical sphere noticeable progress has been traced in relations with Russia, while relations with Europe have deteriorated greatly. Last but not least, the cultural sphere demonstrates political polarization and a devaluation of the cultural product as itself. ACT presents the 2011 NGO sustainability index of Belarus. An assessment of the sustainability level of NGOs has been carried out in Belarus since 2000. Despite the fact that Belarus currently has the lowest position in the NGO sustainability index among 61 countries, experts point out the great resilience of Belarusian CSOs and their willingness to act. The legal environment and financial sustainability remain the most problematic areas for Belarusian CSOs, while organisational development is the strongest component. ​First issue of the LawTrend Monitor is published. The Legal Transformation Centre has issued the first edition of the LawTrend Monitor magazine. The online publication, which is available in Russian and English, is dedicated to problems of freedom of assembly and fair trials in Belarus. Two media realities: cause or consequence? – Journalist Andrei Alexandrov (mediakritika.by), on the basis of an analysis of state and independent news feeds and newspapers, captures the existence of two media realities which are created respectively by the state and independent media. "The different journalisms" in their focus provide different news and use different principles of information presentation. The expert is concerned about whether the two media realities are a natural by-product of a split society or its root cause. Half of Belarusians want to leave the country. The recent opinion poll of IISEPS showed that half of the citizens of Belarus want to leave the country. Deutsche Welle interviewed experts who explained that the desire of Belarusians to leave the country is a result of low salaries. The majority of potential migrants would like to move to Germany. Will Ales Bialiatski get a Nobel Prize? Andrei Eliseev tries to predict the chances of human rights activist Ales Bialiatski winning the Nobel Peace Prize. The expert notes that the list of nominees for the 2012 Nobel includes many famous personalities, but there are some positive factors that increase the chances of the Belarusian for the Award. In particular, chairman of the current Nobel Committee, Thorbjørn Jagland, knows Ales Bialiatski absentia quite well. The investment plans of the government have failed – Dmitry Zayats from Naviny.by presents an overview of the investing situation in Belarus in the first half of 2012, tracking the major investing sources and trends, analyzing their chances of fulfilling the government’s plans. In the article, the experts say that without any changes to the privatization policy and investment climate in the country, there should be no expectation of considerable economic growth. ​Top 10 failed investment projects – TUT.BY analyses the most famous cases of failures of big projects with foreign investors in Belarus. The experts come to two obvious conclusions: half of the projects were the victims of a "bubble" that inflated before the global economic crisis, and the Belarusian authorities could not find a common language with other investors. Government lobbyists do not have reform fever – Despite the deeply-rooted image of the sole ruler standing at the steering wheel of the country, some of the events which have taken place over the last two years in the politico-economic arena show that there are other internal forces close to the government that are able to influence the decision-making process in the country. Nikita Belyaev compares the Belarusian lobby with that of other Eastern European countries, explaining how these differences influence reform movements in the country. Sergei Matskievich: authorities do not feel any responsibility for the country. Belarus Partisan interviewed the Chairman of the Working Group of the NGOs Assembly, Sergei Matskevich, on the following issues: why there is no "fresh blood" in civil and political activities; why official Minsk hinders the implementation of European programmes of the "Eastern Partnership" and "European Dialogue with Belarus", etc. What will it take to get people out in the streets? – Tatiana Gurinovich from BISS explains the lack of protest potential in major groups of Belarusian society. The author suggests that the only solution to such situation is diminishing the role of the state in the economy and growth of private sector, which would lead to establishing a fair situation on the market and release it from the government’s control. 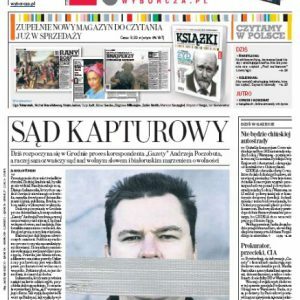 The Polish press most frequently reported on the teddy bear affair over the last weeks. The newspapers follow the actions undertaken by the Belarusian authorities aimed at the investigation and punishment of those related to it. Other issues covered include the September parliamentary elections, the opposition, the regime’s internal games and the consequences of the Belarusian economic crisis. The Teddy Bear issue was broadly covered by the Polish press. Polska The Times reports on the repercussions aimed at the officials responsible for the air zone security. Two generals Ihar Rachkouski and Dzmitry Pakhmielkin have already been dismissed for the alleged failure of their duties which resulted in the light aircraft entering Belarusian territory from which the individuals on the plane threw out the teddy bears over the country. Gazeta Wyborcza reports that an "electoral war" is taking place in Belarus. According to the newspaper, Lukashenka’s regime, through the repression of the opposition and intimidation of its own political apparatus, is about to mobilise its political apparatus. The newspaper suggests that these actions are accompanied by an intensified anti-corruption campaign aimed at the administration's employees to signal that the repression can touch anyone who is against the regime. While the regime consolidates itself, the political opposition remains divided over whether boycott of the elections or participation in them would be the best. Gazeta Wyborcza reports also on the formation of the election committees and low number of opposition representatives, which is less than in the last parliamentary elections in 2008. It highlights the fact that according to political activists, opposition candidates are often not registered. Polska The Times informs that Alexandr Milinkievich, a leader of the For Freedom movement, announced his intention to take part in the parliamentary elections campaign. In the aftermath of his failure to win the 2006 elections, he did not take part in the following elections. The newspaper cites Milinkievich arguing that his decision to actively campaign in the September elections is due to the fact that the Belarusians should understand the necessity for change and have a sense of responsibility for the country. The newspaper also stated that there is no unity among the political opposition in Belarus in regard to their strategy for participation in the elections. Gazeta Wyborcza informs that two other ex-candidates of the presidential elections will not take part in in the electoral campaign, Mykola Statkevich and Ales Michalevich. The chairman of the Central Election Commission of Belarus, Lidia Yermoshina, explains that neither have created groups that could collect the necessary signatures for their lists. With regards to Statkevich, she explains that the prisoner could not apply for registration of such an initiative group. Michalevich, on the other hand, does not live in Belarus and has a standing international warrant from Belarus. Gazeta Wyborcza reports that President Lukashenka signed the amnesty bill. Thank to this bill, over 2000 people will be released. However, the independent media suggests that no political prisoners will be set free. Among those who will be embraced by the amnesty might be people sentenced for small petty crimes, pregnant women, and under some conditions also those sentenced for abuse of power and position as well as others. Elsewhere the newspaper reports on Lukashenka’s preparations for the upcoming elections. Wprost suggests that the pressure upon independent activists in Belarus has increased over the last few months. The Belarusian courts charged Dzmitry Wus and Andrei Mouchan due to their anti – regime activities. It claims that imprisonment of the youth and political activists is on the rise as are bans on leaving Belarus. The newspaper comments on the new wave of political prisoners, like Vasil Parfiankou, arrested for 6 months for breaking his terms of release. Newsweek deals with the issue of the imprisonment of Andrzej Poczobut, a chairman of the Governing Council of the Union of Poles in Belarus, unrecognised by official Minsk. He has been charged with the defamation of President Lukashenka. It further reports the opinion shared by many independent media outlets that the authorities treat the issue as a bargaining chip in regard to relations with Poland and a signal to journalists to stay quiet leading up to the upcoming parliamentary elections. Rzeczpospolita takes a closer look at the recent mass purchase of foreign currency by Belarusians, despite the fact that authorities have established certain barriers against it. According to the newspaper, it will lead to the bankrupting of the economy, though potentially not as severe as last year's crisis. The purchase of foreign currency in banks increased in June to 20.6 per cent. An increase in inflation and other negative tendencies in the economy can spread even more panic among Belarusians. Rzeczpospolita argues also that the Belarusian authorities falsify statistics on the Belarusian economy and hide the true level of unemployment in Belarus. By proving this statement using the data of the World Bank, the newspaper suggested that its level is even seven times higher than what the official data presents. According to the newspaper, there are more problems related to the low benefits payments and unemployment registration procedure, which discourage jobless people from searching for a job. Moreover, lack of interest in the privatisation, both by the heads of state–owned companies, but also by workers, are among the reasons why the Belarusian economy has lost its dynamism over recent years. Wprost comments on the economic situation in Belarus. It reports that Minsk asked the Anti – Crisis Fund of the Eurasian Economic Union for the next tranche of its loan. It noted that the sum of the three previous tranches is estimated at $1.68bn. At the same time, the authorities also declared increases in the prices of communal service (utilities) and transportation. Wprost also pointed out that in 2011, Belarus was credited for a $3bn loan from the EurAsEc. Rzeczpospolita writes about the social effects of the economic crisis, calling it ‘Belarus' minor stabilisation'. It argues that the crisis has resulted in further economic and political dependence on Russia, and furthermore it has also led to the impoverishment of society. The financial assistance from Moscow, particularly lower prices for gas, duty free oil and the purchase of Beltransgas by Gazprom, helped Minsk to manage inflation. At the same time, the current economic situation has led to Belarusians losing their political engagement and interest in the upcoming elections, which is the real factor that could eventually bring about significant changes.